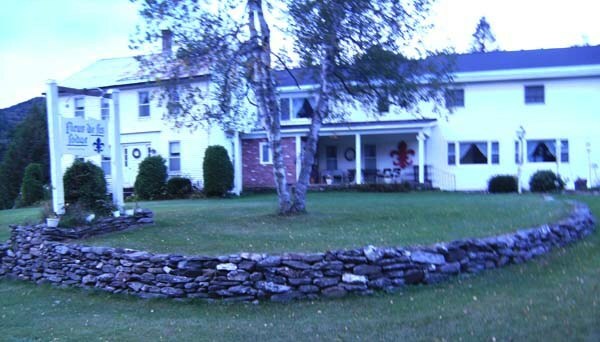 Welcome to a charming New England farmhouse remodeled for families and couples enjoying a comfortable vacation. The Fleur De Lis first opened it's doors to guests in 1960. The majority of their guests return every year, come see the hospitality that keeps them coming back for more. Once you enter the doors you don't just feel like family, you are. Located on scenic Route 100, 8 miles north of Route 4. Minutes from Killington and Pico ski areas; 30 minutes from Okemo. 45 minutes from Mad River and Sugarbush; 75 minutes from Stowe. Meals are served family style at 6 PM every night except Friday. A hearty breakfast is served every morning with an endless coffee pot. Rooms are comfortable sleeping 2, 3 or 4 people. Two rooms share a hallway bath and 11 rooms with private bath; some rooms have additional auxilliary electric heat. The lounge is divided in sections: bar room with ice and refrigerator; ski tuning room; table tennis room; reading room and game table.